SuperSkeleton for WordPress is responsive (try resizing your browser)… that means that it’ll flex to fit massive screens, or itty bitty iPhone screens (and everything in between). Touch gestures even work on the slider! We’ve got SEO and other fancy search engine optimization tricks baked into the theme as well… so it’ll get crawled well and people can find ya easier! There’s even some social stuff included as well! It’s all built on the SuperSkeleton theme system – a robust, flexible, magically delicious system that’s collected nearly 6,000 sales in just a couple months! Oh, and the markup, it’s fully standards compliant and written in a way that’s easy to understand. No messy naming silliness… just simple, semantic class names that anyone can understand within minutes. Heck, it’s based on the popular 960.gs, so unless you’ve been living under a rock, you know this is going to be pretty simple to use. SuperSkeleton is well organized. Take what you love, leave what you don’t, customize the rest. It’s completely in your hands – turn it into the next big thing, or just as your little personal projects, it’s up to you. 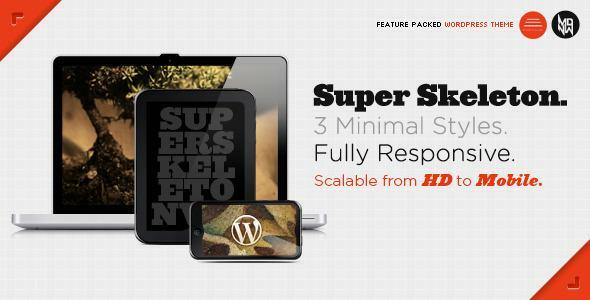 Share the post "Super Skeleton WP: Responsive, Minimal, Beautiful"